After running for twenty five years and has seen four generations worth changes, Mazda MX-5 Miata RF is called has a popularity which is not many other roadsters can match it. With its small size and light weight also, no wonder the cars from the city of Hiroshima, Japan dominated the market of open-roof cars. However, not everyone likes the roof made of cloth, or soft top, which are famous for being used by the Mazda MX-5 since it was first launched. Therefore, today Mazda introduced the Mazda MX-5 Miata RF Custom Style, which has a solid roof with targa models, and accompanied with more sporty touches. As quoted of TopSpeed, the Mazda MX-5 RF Custom Style has been given a suspension, strut tower, and more sporty sway bars. 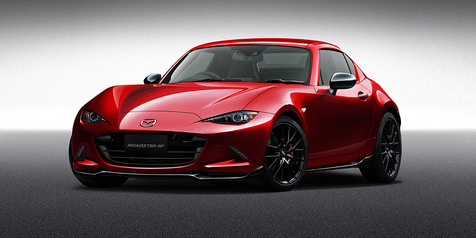 Furthermore, these red-classic colored Mazda MX-5 RF Custom Style gets splitter and side skirts painted in the black, as well as brand-new sporty exhaust helped decorate the exterior.